Having achieved a remarkable eleven lifers on the Cocos Islands, I couldn't help wondering what treasures were in store for me on Christmas Island. As this was my fourth visit to Christmas, I had no right to expect anything new. Perhaps not the rarest possibilities, but there were three birds I particularly wanted to see: Grey Wagtail, Savannah Nightjar and Watercock. It seemed to me that Grey Wagtail was a glaring omission from my list. It was a bird I really should have seen by now. As for the Savannah Nightjar, I'd heard it on my second visit to Christmas Island in 2007, and I regretted not being able to count it. I really wanted to add it to my list. I'd hoped to see a Watercock on my first visit, but quickly realized it was not an easy bird. I reckoned I'd earnt it now, on my fourth visit. The Class of December 2016. Back row: Robert Shore, Irena Earl, Richard Baxter, Glen Pacey, Damien Baxter. Front row: Warwick Remington, David Koffel, Hedley Earl, me, James Mustafa, Mike Carter. Photo by Warwick Remington. In fact I saw another seven lifers on Christmas Island in December 2016, bringing my life total to an incredible 799! I did see Grey Wagtails (five birds, I think) but, although I heard it again, I could not see a Savannah Nightjar. However, I did see a Grey Nightjar, which is perhaps rarer. I walked through much dense undergrowth, hoping for Watercock, or indeed Swinhoe's Snipe, which I also wanted to see, but I didn't flush a thing. How lucky was that! The Japanese Sparrowhawks were tiny. They were so small that I was surprised that they can ever be confused with Chinese Sparrowhawks. We also saw the local race of Striated Heron (amurensis) and Peregrine Falcon (calidus). Of course we saw all the endemics. 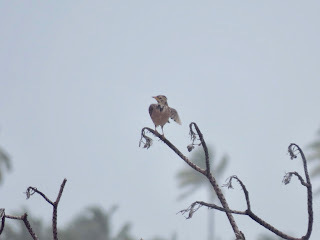 The Island Thrush and Christmas Imperial-Pigeon were very common (as were kestrels) and we saw white-eyes and frigatebirds every day. Every lunchtime I spent examining tropicbirds. Most were Golden Bosunbirds, some were White-tailed Tropicbirds and a few were Red-tailed. I was looking for a Red-billed Tropicbird. It really was needle in a haystack stuff. Scores of tropicbirds wheeled overhead. I searched the sky. The birds were often very high, and were often attacked by frigatebirds that were waiting for them returning from their morning feeding out at sea. I would never be able to discern a red bill. I was looking for a dark back. Alas! All the tropicbirds I saw had pure white backs. Richard had planned a boat trip around the island, which I thought would give me another chance of seeing the Red-billed Tropicbird. Unfortunately, seas were rough and the boat trip was cancelled. The red crabs were migrating, but numbers were not as spectacular as I've seen on previous trips. We had quite a bit of rain, and got wet through on several occasions. Food was ordinary (apart from meals provided by Lisa, which were excellent, and a couple of dinners at the Chinese restaurant) as the island was running out of food. The Noodle Bar was closed. Seas were rough and the supply ship could not berth. At dinner on the last night, everyone was asked to name the best bird of the trip. On these occasions, someone always says 'Golden Bosunbird.' They are, indeed, beautiful birds. 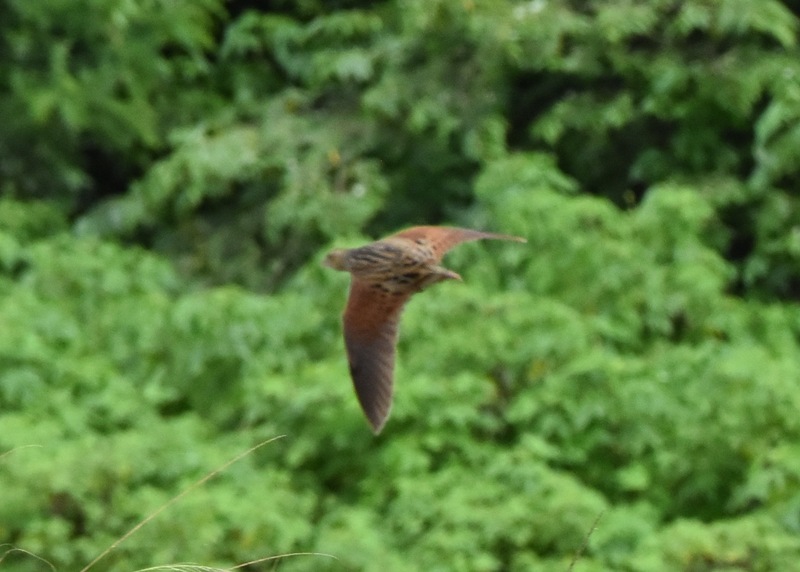 But my bird of the trip (and I'm surprised that no one else named it) was the Corn Crake. HANZAB has only two reports of Corn Crake in Australia: one in Randwick, NSW in June 1893 and the other on board ship off Jurien Bay in WA in December 1944 (the previous port of call was Melbourne). So, while we saw birds that were not on the Australian list, the Corn Crake has been sitting stubbornly on the list, unseen for 72 years. I always enjoy adding a new bird to my list. But I seem to get more pleasure out of ticking birds that I never expected to see, birds that I cannot seek out, birds that haven't been seen for many years. Surely there is no better candidate than the Corn Crake. Richard is to be congratulated for another extremely successful trip. He managed to ensure that almost everyone saw almost everything. Several people on the trip achieved milestones: most notably, Glen Pacey reached 800. Well done, Glen. Richard Baxter's tours of Cocos and Christmas Islands are now essential for any serious twitcher. Jenny Spry, the first woman to achieve an Australian birdlist of 800 birds, told me that the secret of reaching 800 birds was to do lots of pelagics. This may be true for Jenny, but I've done an awful lot of pelagics without adding anything to my life total. I think the secret to reaching 800 Australian birds is to go on Richard Baxter's bird tours. I was with him in the Torres Strait last March when I added 7 to my life total. And in December 2016, I visited Cocos and Christmas Islands with him. This was my third visit to the Cocos Islands with him. I added eleven birds to my lifelist: 8 on West Island and 3 on Home Island. Not bad by anyone's standards. Richard took ten birders on this trip. We arrived on Cocos at about 10.30 on Saturday and saw Pin-tailed Snipe almost immediately. I saw my first lifer before lunch on the first day. It was Yellow Bittern (782). There were three birds, uncharacteristically standing out in the open, giving us all excellent views. I had a feeling then that this was going to be an exceptionally good tour. After lunch, we drove to the airport. A Rosy Starling (783) flew overhead and we saw Oriental Pratincole at the end of the runway. The starling sat up in a dead tree, allowing great views through the scope. I remember when I saw my first Roseate Tern, I was disappointed at the lack of pink. There was just a very subtle hint of colour. The Rosy Starling was the same. It is barely pink at all. The next day, Sunday, I had two ticks before breakfast! The first was von Schrenk's Bittern (784), which we flushed from the undergrowth near the airport, and the second was an Asian Brown Flycatcher (785) that appeared right in the tree Richard said it would, after about half an hour of hot waiting. After breakfast, Richard took us to the farm, where we looked unsuccessfully for Brown Shrike and attempted unsuccessfully to flush Watercock. During the lunch break, James Mustafa and I decided to go looking ourselves and returned to the farm. Of course, we could not see anything new, but we wandered happily around, just pleased to be on Cocos. We decided to do one lap around the fence before returning to the others. Almost immediately a black bird flew overhead and landed high in a large tree. It had an undulating flight, like a Black-faced Cuckoo-Shrike, and, when it landed, I could see it had a fish tail. 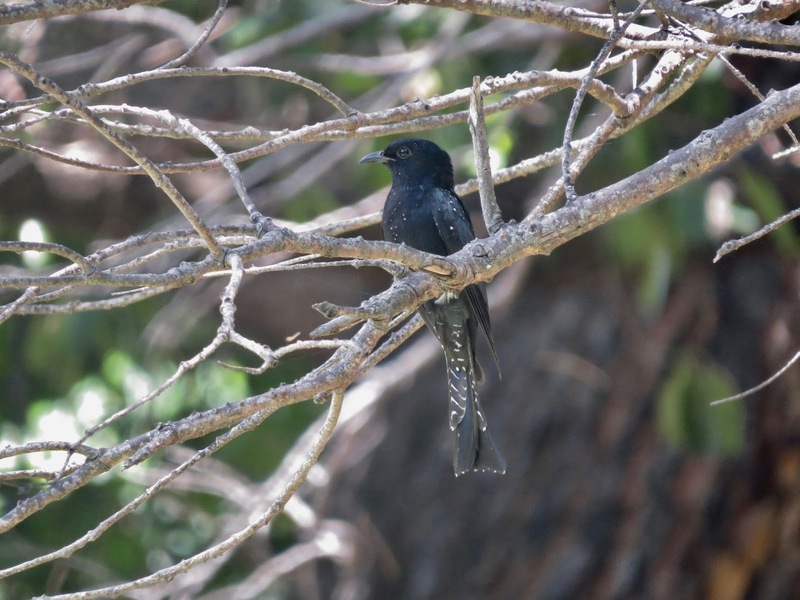 It was a Drongo Cuckoo (786)! We rushed back to tell the others, and were severely reprimanded for not leaving one person with the bird. I was pleased that I had not waited in the hot sun, as it took half an hour for everyone to gather together and return to the farm. 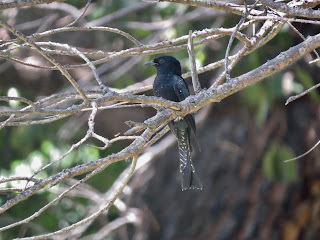 The Drongo Cuckoo had quite disappeared. By way of compensation, the Brown Shrike (787) put in an appearance, sitting high on a branch, giving great views. On Monday we all took the early morning ferry to Home Island. A few of us spent a couple of nights in Oceania House on Home Island. This had the advantage of having eyes and ears on both islands, which paid off because we managed to find a night-heron the next day. Oceania House was built in 1887 by George Clunies-Ross, grandson of John Clunies-Ross who moved his family to live on the previously uninhabited islands in 1827. He planted coconuts and established a copra business, importing Malay labourers to do all the work. The Malay population on Home Island today is descended from Clunies-Ross's workers. Oceania House is a two storey mansion built of glazed white bricks imported from Scotland, and furnished with impressive antiques. On Monday, we searched unsuccessfully for Watercock, saw Chinese Sparrowhawk being mobbed by White Terns, got good views of Barn Swallows, and admired a Chinese Pond-Heron. 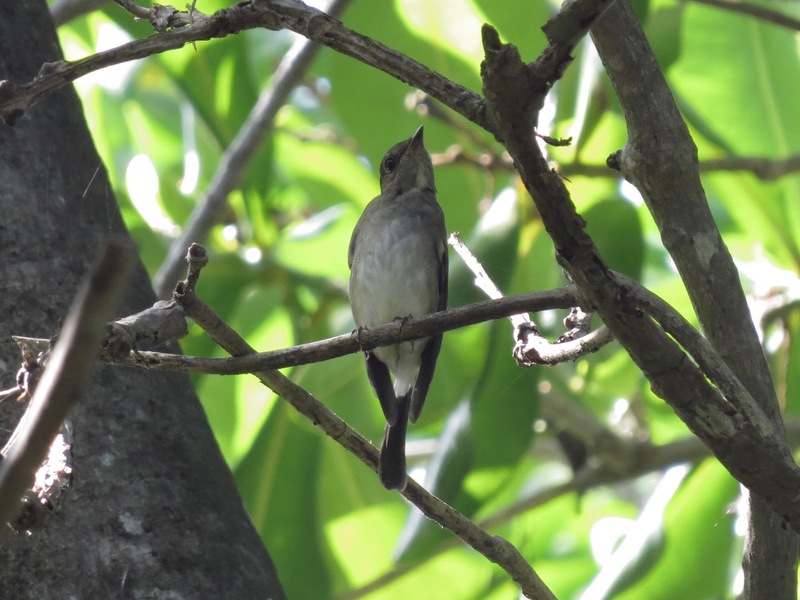 In the gardens of Oceania House, we saw a Blue and White Flycatcher (788) as well as another unidentified flycatcher showing some yellow. James and I staked out the tree the unidentified bird was in, and decided to forego dinner in an effort to try to get a good look at it. We did not. Despite several hot hours of dedicated watching, we could not see any bird. 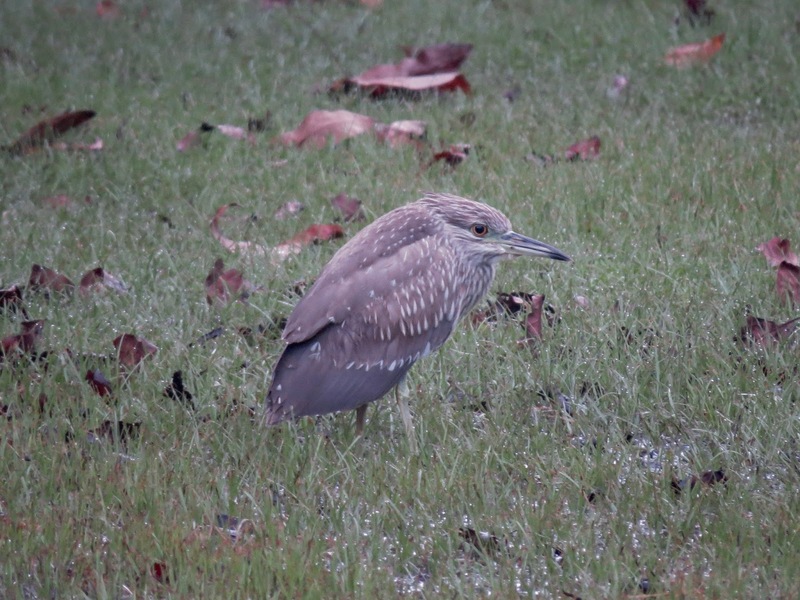 Early on Tuesday morning, we found the Black-crowned Night-Heron (789) and alerted the others. Then we saw the Eye-browed Thrush (790) in the gardens. I glimpsed this bird several times before I eventually had excellent views. On these trips there are always disappointments. Watercock was one for me on this trip. And we all tried hard on several occasions to see a couple of cuckoos, apparently a Plaintive Cuckoo and an Indian Cuckoo. But perhaps the biggest disappointment was a bird that three of us saw and heard, and James saw quite well. I suspect it was an Asian Paradise-Flycatcher, but we will never know. It was perched in a tree above James' head, it flew, calling, over my head, and passed Mike Carter, who saw it too, before it disappeared over the fence. 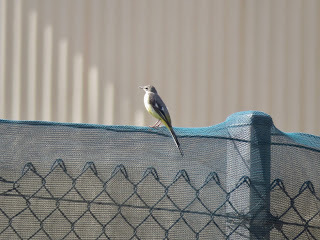 James ran around the fence and saw it again, so you'd think it would be possible to identify it. Mike said it could have been a paradise-flycatcher. All I saw was a small bird with white underneath, but later, when Richard played a recording of an Asian Paradise-Flycatcher, I thought that was the call I'd heard. It is human nature to regret the one that got away, when, on any measure, we all enjoyed many wonderful new birds. Wednesday was my first day of the trip without a tick. Very bravely, I waded through water above my waist, to an island looking for Common Kingfisher, and sat in the hot sun for over an hour. The kingfisher did not keep his appointment. Thursday was my second day without a tick and I began to wonder if I'd see any more new birds at all. We were back on West Island again, and everyone else departed to see Saunders's Tern and Eurasian Curlew. I'd seen both these species, so I stayed at home, to watch at the swamp for a Northern Pintail that I'd been told sometimes put in an appearance. 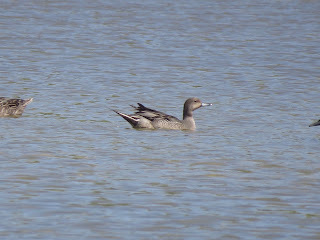 The Eurasian Teal that has lived at the swamp for some years now, was present among the Pacific Black Duck, but, despite many visits, I had so far missed out on the pintail. 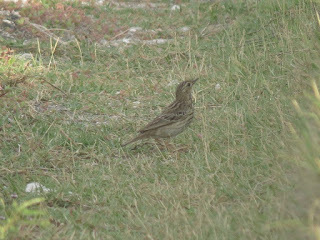 On Friday, at the airport, we saw a pipit, in exactly the same spot as I'd seen my first Red-throated Pipit on my previous trip. Mike Carter thought it was an Olive-backed Pipit, which I thought would be very exciting, giving me a second OBP on my birdlist. The bird was extremely cooperative, giving us all wonderful views, and thanks to the photographers present, we had excellent proof of what we saw. 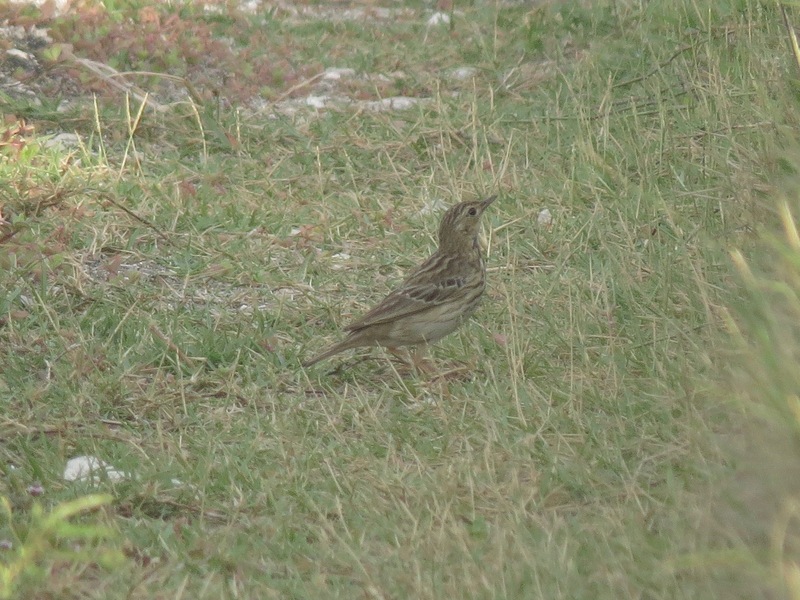 In the end, everyone agreed it was a Tree Pipit (791)! James and I visited the swamp again (my ninth visit) and this time we're rewarded with the Northern Pintail (792), making a fabulous eleven ticks on the Cocos Islands. On Saturday, we flew to Christmas Island. I was booked on Richard Baxter's Cocos/Christmas Island tour in December 2016, so I arranged to have a day in Perth beforehand, in the hope of seeing a Crested Honey Buzzard. Then I learnt that friends were visiting Cheynes Beach for a couple of days before Richard's tour, and, even though it was to be a very rushed trip, the opportunity was quite irresistible. I don't know how many times I've been to Cheynes Beach, probably half a dozen, but despite many hours of trying, I've never managed to see the local Western Whipbird. I've seen this bird on Kangaroo Island and on the Eyre Peninsula, but both WA races have always eluded me. So, before Richard's tour, I had one day in Perth and two nights at Cheynes Beach. I expected one lifer: the Crested Honey Buzzard. And I wanted to see at least one WA race of Western Whipbird. The buzzard has been turning up in WA regularly each summer for the last five years. It usually appears around 15 November. I thought I'd call in on 29 November, giving it a couple of weeks leeway. But, this year, the year I wanted to see it, it decided not to come. Doesn't it realize how much I wanted to admire it? Doesn't it know how much money I spent to include it in my itinerary? For whatever reason, the buzzard was a no show. My mate Steve Reynolds, who was going to show me the buzzard, refused to accept its absence and took me to Lake Joondalup where it usually hangs out. We thought it would be amazing if we were the first to report the buzzard this season. Of course that was a fantasy and the buzzard refused to show itself. Steve then drove me to Northam to admire the Mute Swans. I'd seen them in Tasmania decades ago, but I'd never seen them in WA. Unlike the buzzard, the swans appeared on cue, carrying nesting material under their wings, as they swam elegantly on the River Avon. HANZAB reports that, when swimming, Mute Swans 'have jerky, surging progress, paddling with both feet at the same time.' I must say, I didn't notice this. I thought they looked very graceful, quite worthy of their regal heritage. The next morning, my mate James Mustafa arrived at 6 a.m. and, with Steve, we set off for Cheynes Beach. First stop was Australind, just north of Bunbury, where an Eurasian Curlew had been in residence for several months. We could see waders in the distance, too far away to identify, so there was nothing for it but to wade a bit closer. Anyone who knows me, knows that I don't like getting my feet wet. But, what's a girl to do when there's a possible tick in the offing? Without a word of protest, I took off my shoes and socks, and joined the boys in the water. I did not like it. We didn't know how deep the water would get, we didn't know anything about tides or rips, and the curlew may not be with the waders we could see in the distance. After a very few unhappy steps, Steve jumped. He'd been nipped by a blue swimmer crab, invisible just under the sand. Yet another reason to hate the water. Then James jumped. Now I was really unhappy. Steve jumped again. And again. I thought this was a really stupid idea. It took a few minutes for the boys to realize that I was right. They had both been nipped several times. I escaped altogether. Back on terra firma, we drove around some more, examining several inlets, hoping for more waders. I was aware of the time. We had a many miles to travel that day. Several lifers were awaiting James further south; we couldn't spend all day looking for a bird that both Steve and James had already seen. Finally, Steve parked the car and we jumped out for one last look. I was feeling disappointed. The buzzard had let me down. Now the curlew that everyone else in the world had ticked, had suddenly disappeared. It wasn't fair. Suddenly, Steve was gesturing at me from the top of a rise. I ran as fast as I could up the hill and there was the bird! Yippee! It was right beside a Far Eastern Curlew, just to emphasize the difference. At Rocky Gully township, we paused to photograph Muir's Corellas, a lifer for James. Next stop was the Stirling Range Retreat, which (so Steve assures me) is a good spot for Western Shriketit. Here we met the fourth member of our gang, Steve Castan. It was a bit windy so we didn't spend time looking for Western Whipbirds here. 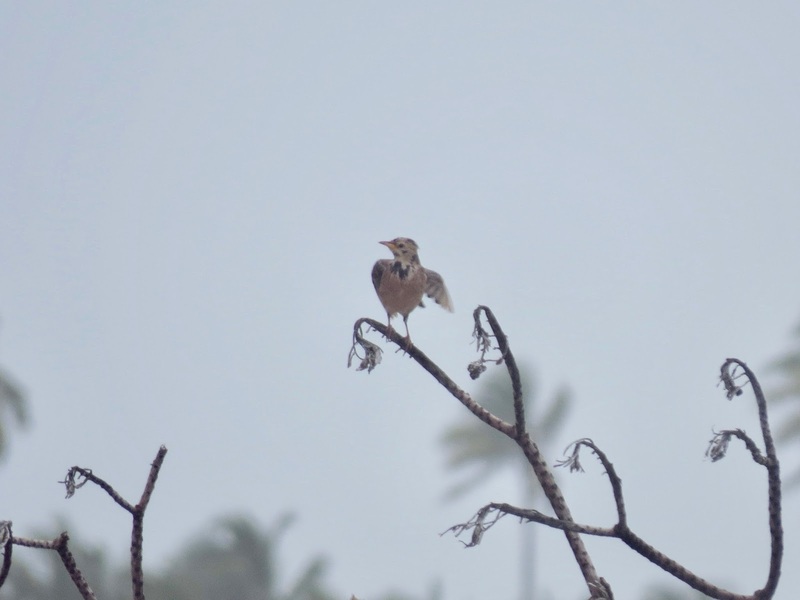 We did, however, find a Western Fieldwren for James. Then it was on to Cheynes Beach, where we sat in deck chairs, sipping wine and nibbling potato chips, waiting for the Noisy Scrub-bird to run across the road in front of us. Which it obediently did. White-breasted Robins played near my cabin and Western Wattlebirds and White-cheeked Honeyeaters were prolific. We saw several Western Bristlebirds and lots of Heath Monitors. At Two People's Bay, I glimpsed a Western Whipbird. At last! The bird that had eluded me for decades. At Waychinicup, Steve produced a beautiful Red-eared Firetail, right on cue. On Friday, we returned to Perth. It had been a rushed trip, but very successful. James and I were eager for our next adventure: Cocos and Christmas Islands. We both had great expectations.